People Often Expect Too Much. Understanding What We Are Up Against. Many experiencing male pattern baldness become what I refer to as "message board groupies". They spend countless hours reading, researching, and posting on hair loss related forums. It is a great way to get psychological support by relating with others in the same predicament. But many people who spend time on these forums can often come away with a negative view on all hair loss treatments. "Is it all a scam?" is a frequent type subject line. I don't share this negative outlook to the degree that many message board posters profess. First I feel there's a correlation between those that have tried many hair loss treatments (that have been unsuccessful) with those that tend to read and post on message boards. Those that feel their hair loss condition has improved or at least has been held in check with their current treatments tend to "move on to other things". They say to themselves "well that problem is solved so let's move on to the next problem in life". So I believe that those that are left posting on message boards tend to "skew" the apparent success rate of hair loss treatments. They tend to make success rates look much less frequent than they really are. Men experience various degrees of the severity of male pattern baldness. Those that experience the worst cases tend to do poorly from any treatment. Think about it. If you felt you've solved your hair loss problem with a particular type of treatment would you still be reading and posting on message boards so often? Would you not change your focus in life to other things? I believe those that frequent these type of forums tend to represent a subgroup of the most severe cases of male pattern baldness. Therefore reading the posts of message boards will tend to often give us the impression that nothing seems to work. I believe this to be untrue for most people. We must always factor this in when reading and posting on these type forums. Another concept that many people can't grasp is the need to stick with a treatment for a very long period of time. It takes generally 6 months to a year to really evaluate whether a particular treatment has been helpful or not. Even this kind of patience may not tell us information that is valuable. For example suppose you have less hair than you did after one year on a particular treatment. Most would conclude that the treatmant has not worked and abandon it. How do we really know that the treatment in question may have in fact slowed the rate of the balding process? How many times have we read stories of people that abandon treatments they felt were worthless and then shortly after this they experienced an accelerated rate of hair loss? Conversely, suppose your hair has improved somewhat over the last year on a particular treatment. How do we know our success is more related to a change in the underlying condition of hair loss for the better? We may wrongly conclude that a treatment is working when in fact our hair loss condition has simply abated for a period of time.....something that frequently happens with male pattern baldness. The very fact that the condition of male pattern baldness can "wax and wane" over the course of a lifetime combined with the fact that it takes so damn long to figure out whether something is working for us or not is the biggest reason why male pattern baldness success stories are so rare. Another thing I've learned is that many people expect too much from hair loss treatments. 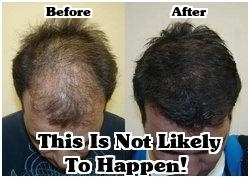 If you are hoping to regrow a bald spot that has been that way for more than 2-3 years.....forget it! Success rates are so slim they are not worth mentioning. If an area has been bald for more than 5 years I have yet to see or hear of a single believable success story for this type of individual. In my opinion the goal should be to hang on to the hair you have rather than hope to regrow any significant amount. Hoping for regrowth to any great degree is simply setting yourself up for disappointment down the line.